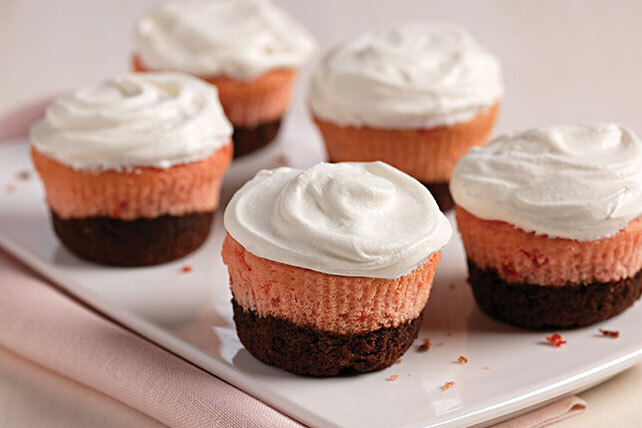 They're just like the ice cream, only in scrumptious cupcake form—with a brownie bottom, whipped frosting and strawberry cake in between. Prepare brownie batter, then cake batter in separate bowls as directed on packages. Spoon brownie batter into 24 paper-lined muffin cups; cover with cake batter. Bake 21 to 24 min. or until toothpick inserted in centers comes out clean. Cool cupcakes in pans 10 min. Remove from pans to wire racks; cool completely. Spoon frosting into medium bowl. Add COOL WHIP; whisk until blended. Spread onto cupcakes. Filling muffin cups with muffin or cupcake batter can be a messy task. Make it neat and easy by using an ice cream scoop to fill the cups. This also ensures that an equal amount of batter is portioned into each muffin cup.